What better way to explore the Land Down Under than on an Australia & New Zealand cruise? What better way to explore the land down under than on a magnificent cruise to Australia? From exotic wildlife and untouched nature to urban hubs and cultural capitals, Australia is a destination that has fascinated adventure-seekers for decades. Fly to Australia and sail along the coast, or combine it with a trip to New Zealand, Tasmania, or southeast Asia on a repositioning cruise. Stick to the mainland, or explore the numerous islands located just off Australia's coast. Australia has no shortage to offer nature lovers. Boasting some of the most unique wildlife on Earth, you'll have the chance to get up close and personal with a koala, or see a kangaroo in its natural habitat, during an exciting shore excursion. Scuba divers won't want to miss an excursion to the Great Barrier Reef, and water-lovers will enjoy swimming, snorkeling and surfing along the sandy beaches. Take in the stunning natural landscapes of New Zealand's Fjordland National Park, or explore the manmade wonder of the Sydney Opera House. 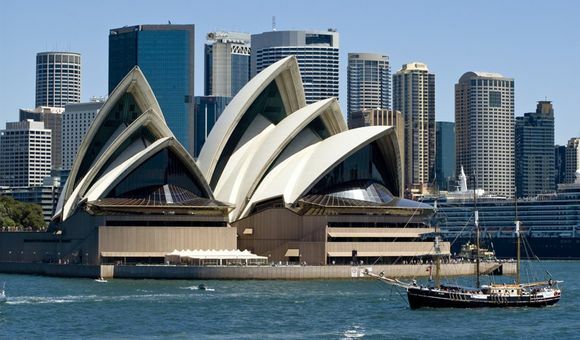 The vibrant cultural capital of Australia, Sydney is a must-see city for anyone visiting the Land Down Under. From the silhouette of its iconic opera house perched on the edge of the water to the idyllic green hills of the Blue Mountains sprawling from the city, Sydney is guaranteed to capture your heart. With its pristine beaches, landmark architecture, and charming islands, you may never want to leave Sydney Harbor - but venture outside the city and you'll be rewarded with a world of incredible nature just waiting to be discovered. New Zealand is home to more than just beautiful landscapes and hobbits. A melting pot of different cultures, its blend of European, Pacific Islander, and indigenous Māori heritage give the island its unique charm. To get a real sense of the colonial, geographic, and indigenous forces that have shaped this city, be sure to check out the Auckland Museum, located in the heart of the city. Nature lovers might find themselves more drawn to the volcanoes, beaches, and caves nearby. Step into the magical Shire at the Hobbiton movie set – a must-see for Lord of the Rings fans! A colorful subtropical city, Brisbane is the perfect gateway to both the Gold Coast and the Sunshine Coast. The capital of Queensland, it’s a cultural hub full of hip bars, charming art galleries, and museums. To truly take in the city, climb the nearby Kangaroo Point cliffs, where you’ll be treated to a breathtaking panoramic view of the Brisbane city skyline. If you’re staying a bit longer, there are plenty of nearby islands, forests, and vineyards just waiting to be explored. Once a Victorian seaside resort, Melbourne has evolved into a hip capital of culture where the party never stops. Its world-famous arts scene means it’s home to multiple exhibits and festivals each year. History buffs won’t want to miss out on historical landmarks such as Flinders Street Station, an Art Deco cinema called The Astor, or the Old Melbourne Gaol, a former prison for convicts. Those more interested in the 21st century will delight in the numerous art galleries, cocktail bars, and cafes just waiting to be discovered. And to keep its residents fueled up for all-night parties and high energy festivals, Melbourne reportedly has the best coffee in the world. The capital of New Zealand, Wellington is a charming, coastal city with a number of cultural centers and landmarks disproportionate to its size. Its picturesque crescent-shaped harbor is the perfect place for a pleasant walk on a calm day, or you can explore the surrounding countryside on a guided tour – a landscape you just might recognize from New Zealand’s most famous fantasy film trilogy, The Lord of the Rings. Immerse yourself in Middle Earth on a Lord of the Rings tour. Visit Weta Studios with its collections of sets, props, and costumes, or tour the locations where the movies were filmed on-site. Located in Australia’s only truly tropical region, Darwin is a melting pot of cultures and creatures. Its proximity to southeast Asia mean it’s full of Asian culture and cuisine, and you won’t want to miss the bustling markets serving up authentic international cuisine. The adventurous Aussie spirit is alive and well too, and you can channel your inner Crocodile Dundee as you explore the rivers and wetlands by boat in hopes of catching a glimpse of Darwin’s famous saltwater crocodiles. And the area has a fascinating history, from aboriginal cultures to colonization to World War II. Tauranga is a booming port city surrounded by stunning nature. Its bustling waterfront is full of diverse restaurants and pop-up shops that are popular among tourists and locals alike. Nearby, some of New Zealand’s greatest natural wonders are just waiting to be discovered. From the nearby Mount Maunganui to the hot springs of Rotorua to the marine life living just offshore, Tauranga is the perfect launching point to discover New Zealand’s bay of Islands. Port Chalmers is a historical seaside town, located North of Otago Harbour. Founded in 1844, many of the original brick houses still stand today adding to the historic feel of the town. Some of the very first explorations of the Arctic by adventurers such as Captain Scott began in Port Chalmers. Visitors to Port Chalmers can learn about the historical and modern day importance of the port by visiting the Port Chalmers Regional Maritime Museum. Port Chalmers is also a well-known hub for art and culture, visible by the many antique shops and art galleries located in the area. A visit to Port Chalmers promises to be culturally unique. The Bay of Islands is a sweeping sub-region of northern New Zealand. The enormous inlet holds 144 islands and dozens of cities and towns, each more charming than the last. Breathtaking waterfalls, beautiful rainforests, and clear waters teeming with marine life await, and the region also has a fascinating history marked by clashes between the colonists and the region’s indigenous Māori people. The gateway to the Great Barrier Reef, Cairns is a paradise for outdoor explorers. With picturesque islands dotting its waters, magnificent rainforests just a short distance inland, and miles of sweeping beaches in between, you’ll truly experience the best that Australia has to offer. From hidden coral cays to secret forest swimming spots, Cairns is also one of the best places in Australia to get your feet wet – so don’t forget your bathing suit! Located in the shadow of Mount Wellington, Hobart is Tasmania’s largest and oldest city. Booming with tourism, the town boasts a buzzing waterfront area overflowing with shops, restaurants, and an enormous town market, Salamanca Place. The town center offers a plethora of dining, drinking, and shopping options, including a budding craft beer scene and several galleries featuring local art. Those looking to get away from it all may enjoy a scenic drive to the summit of Mount Wellington, or an excursion to the Bonorong Wildlife Sanctuary. Tucked away on the coast of South Australia, Adelaide is truly a hidden gem. Known as the “City of Churches,” its affluent history means you’ll find plenty of historic spires and lush green parks interspersed throughout its metropolitan center. But gone are the days of being posh and stuffy – this up-and-coming capital is rapidly gentrifying, and it’s become one of the best areas in Australia to eat, party, and drink. The main city in New Zealand’s Hawkes Bay region, Napier is a charming town built in the distinctive Art Deco style of the 1930s. Classic cars, vintage clothing and stunning design await if you choose to tour the city’s historical quarter. Napier is also a great destination for kids, with an aquarium, a technology museum, and a petting zoo all providing great activities for families. Grown-up travelers may prefer to spend the day touring a winery, and adventurous travelers won’t want to miss a day trip to Te Mata Park with its redwood forests and limestone cliffs. Named for the Maori word for “long harbor,” Akaroa is a charming harbor town located about an hour outside of Christchurch. The only French settlement in New Zealand, the town is a mishmash of French, English, and Maori culture. Stroll through the historic town center and take in the quaint European architecture, or explore the serene nature both on and offshore. The harbor is home to a resident population of Hector’s dolphins, the smallest and rarest dolphins in the world, and shorebirds and penguins abound. Airlie Beach acts as the main hub for trips to the Whitsunday Islands and the Great Barrier Reef. Airlie Beach is known as a popular nightlife spot with a host of clubs and bars. Port of Airlie boasts a boating marina along with a range of accomodation offerings and trendy eateries, which guests to enjoy al fresco dining. Every Saturday there are a number of markets offering fresh produce as well as local crafts, providing a great opportunity to experience the culture like a true local. An excursion to the nearby Conway National Park is highly recommended.